New modular data centres in OCP provide sustainable and efficient solutions aimed at OCP hardware. 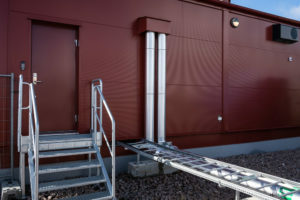 Swedish Modules has initiated a development project as part of the Open Compute Project, with the task of designing a modular data centre optimised for OCP products and OCP criteria – energy efficient, cost effective, sustainable and service friendly. The project is the first in the modular data centre category in the history of OCP. We believe in sharing our insights based on our many years of experience and working with other participants to develop the core of the emerging digital infrastructure: modular, scalable data centers that make it possible to bring computing power closer to the user. When we join forces, we can make faster and better progress. We need to do this to successfully to meet society’s needs for computing power in a market with an annual growth rate of nearly 30%*. “By developing a standard together, we will achieve a highly efficient product that will eliminate prolonged and expensive design sessions. It also creates clarity in ROI estimates and doesn’t tie up resources or capital until you need to do so, as you can scale up as needed. IT is on the way to achieving the same status as electricity in terms of being part of the basic infrastructure of society. From that perspective, we need to develop solutions that are simple, standardised and universally applicable worldwide. This can best be accomplished through broad and open collaboration.” “We are building infrastructure that is crucial for society,” says Roberto Söderhäll, Business Development Officer, Swedish Modules. The OCP-optimised modular data center will be developed by OCP hardware suppliers of racks, servers, switches, and DC power and cooling solutions, along with telecom operators, colocation businesses and cloud service providers. With this approach, the project will integrate valuable perspectives to achieve optimal results. The participants include representatives of both the data center industry and the end-user side, including Facebook, Microsoft, AT&T, Nokia and Schneider Electric. Requirements for the finished product include being easy to maintain, sustainable in production and operation, and easy to connect for reuse of energy. It should also be simple to connect to a power supply and offer an efficient process from assembly to commissioning. In line with the spirit of open innovation, the product should reach the market quickly and be available to customers as early as October 2018. The Open Compute Project Foundation is a rapidly growing, global community whose mission is to design, use, and enable mainstream delivery of the most efficient designs for scalable computing. This commitment to excellence keeps OCP at the forefront of the open source compute movement.